ISLAMABAD: The strategic, all-round ties between Pakistan and the United Arab Emirates (UAE) entered a new phase on Sunday when the two countries decided to constitute a task force for taking all necessary measures to enhance bilateral trade. The development came during a meeting between Prime Minister Imran Khan and Crown Prince of Abu Dhabi Sheikh Mohamed bin Zayed Al Nahyan at the Prime Minister’s Office (PMO) here. Sheikh Mohamed visited Pakistan after 12 years during which he was expected to announce investment packages for Pakistan. Both sides also discussed various regional and global issues and expressed complete unanimity of views in this regard. Prime Minister Imran Khan thanked the UAE for the generous $3 billion balance of payment support and said the assistance testified to the UAE’s continued commitment to and friendship with Pakistan. He welcomed the UAE's interest in investing in oil, gas, logistics, ports and construction sectors. The two sides expressed satisfaction over the ongoing defence and security cooperation and vowed to further boost collaboration in areas of training, joint exercises and defence production. They strongly condemned terrorism in all its forms and manifestations and expressed their resolve to work closely to root out this scourge. Sheikh Mohamed bin Zayed Al Nahyan recognised the efforts and unparalleled sacrifices made by Pakistan to eliminate terrorism and extremism. Prime Minister Imran Khan briefed him on the situation in the Indian Held Kashmir and the plight of Kashmiris. He also briefed him on the PTI government's people-centric reform agenda and the steps taken to promote transparency and accountability at all levels of government. He also briefed the distinguished guest on Pakistan’s continued support and facilitation to the Afghan-owned and Afghan-led reconciliation process. He also appreciated the UAE’s role in hosting the Afghan reconciliation talks in Abu Dhabi. The two leaders agreed to work closely for lasting peace and stability in the war-plagued Afghanistan. The crown prince thanked the premier for the warm welcome and hospitality extended to him and his delegation. Imran Khan personally drove the crown prince of Abu Dhabi to the Prime Minister’s House (PMO) as a gesture of exclusive affection for the visiting leader where meetings and talks were held. The crown prince was presented a guard of honour by a smartly turned-out contingent on arrival in the federal capital. He was given a 21-gun salute. Sheikh Mohammed bin Zayed was given a fly-past by an impressive formation of JF-17 multirole fighter jets of Pakistan Air Force (PAF) manufactured by Pakistan and China. Billboards displaying the crown prince’s pictures and positive messages about the Pak-UAE ties were put up across the city to welcome the visiting dignitary. A troupe of folk musicians and cultural dancers also put on a small show to receive him. Later, delegation level talks between Pakistan and the United Arab Emirates were held at the Prime Minister’s House. 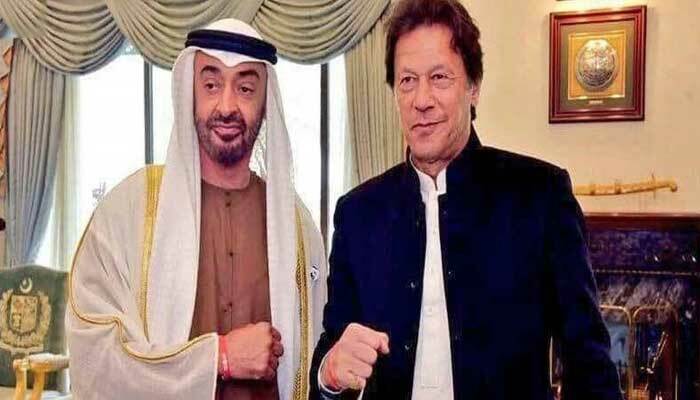 Imran Khan led the Pakistani delegation while the UAE side was led by Crown Prince Sheikh Muhammad bin Zayed Al Nahyan. The Pakistan delegation included Foreign Minister Shah Mahmood Qureshi, Finance Minister Asad Umer, Information Minister Chaudhry Fawad Hussain and State Minister for Interior Shahryar Khan Afridi and Foreign Secretary Ms. Tehmina Janjua. The two sides discussed the bilateral relations and matters of mutual, regional and international interest. Earlier, on his arrival at the Nur Khan Airbase, Prime Minister Imran Khan welcomed the distinguished guest. Later on, an official welcome ceremony was held at the Prime Minister’s House, Islamabad, in the honor of the crown prince. Later, Sheikh Muhammad bin Zayed Al Nahyan left for home. Minister for Power Omer Ayub Khan saw off him at the Nur Khan Airbase. During his one-on-one meeting with Imran Khan, bilateral relations and regional situation among other matters of mutual interest were discussed. The sides also held delegation level talks. Pakistani and the UAE leaders have met thrice in three months. The prime minister visited the UAE twice after assuming office in August to seek economic assistance. The UAE announced that it will provide Pakistan with an aid package which will include $9 billion in oil payments and a $3 billion deposit in the State Bank of Pakistan. The Middle Eastern country will also reportedly announce investment in various fields in Pakistan. The UAE is Pakistan’s largest trading partner in the Middle East and a major source of investments. More than 1.6 million expatriate Pakistani currently reside in the UAE who contribute around $4.5 billion annually to the GDP. Pakistan and Abu Dhabi are also likely to sign a deal for investment of $1 billion by the emirate in setting up oil storages at the Gwadar Port and laying a white oil pipeline during the crown prince’s visit. Meanwhile, sources claimed that the UAE had agreed to invest $1 billion through Mubadala, a global investment company. With this capital injection, the total UAE assistance and investment package for Pakistan will rise to $7.2 billion. It also includes a $3.2-billion oil credit facility and $3 billion in cash support for balance of payment. A joint statement issued after the UAE royal's visit said Prime Minister Khan thanked the crown prince for the "generous" balance-of-payments support of $3 billion, which appears to have materialised first out of the total financial package. According to the joint statement, the two leaders held wide-ranging talks that focused on all areas of bilateral relations. "Taking note of the positive trajectory of relations, the two leaders expressed their determination to further strengthen this historic and mutually beneficial relationship," the statement said. The two sides also discussed issues of regional and global importance, with Khan briefing the crown prince on the situation in Indian occupied Kashmir and the plight of the Kashmiri people. During the meeting, Prime Minister Khan and Crown Prince Sheikh Mohammed noted that the Pakistan-UAE Joint Ministerial Commission, to be co-chaired by the two countries' foreign ministers in Abu Dhabi next month, could “play a pivotal role in chalking out a comprehensive roadmap and in fast-tracking the approval of pending agreements and memorandum of understandings (MoUs)”. The two leaders expressed their satisfaction over the ongoing defence and security cooperation between the two countries and resolved to explore further collaboration in the areas of training, joint exercises and defence production. The new support package from the UAE is the same size and has the same terms and conditions as those given by Saudi Arabia. The total financing support from the UAE and Saudi Arabia, including the ITFC’s trade finance, is to be around $13.9-14 billion when cash deposits of $3bn each from the two countries are also included, according to a cabinet member. Additionally, a $5-6 billion worth of deep-conversion oil refinery is to be set up by Parco at Khalifa Point and an expected petro-chemical complex by Saudi Arabia at the Gwadar Oil City.